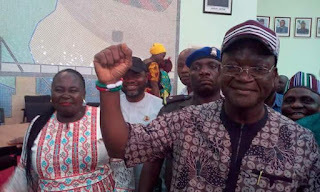 Governor Samuel Ortom of Benue state has announced his defection from the ruling All Progressives Congress (APC) to the main opposition, the Peoples Democratic Party (PDP). Ortom earlier made the announcement at a meeting with elected local government chairmen and councillors on Wednesday at the Government House Makurdi, Channels Television reported. Ortom’s defection had long been expected. The governor joined the APC from the PDP ahead the 2015 elections. He served as Minister of State of Industry, Trade and Investment during the Jonathan administration. He served as the director of operations of the PDP gubernatorial campaign in Benue State in 2007, and later as director of administration and logistics of the Goodluck/Sambo Presidential Campaign Organization in 2011. He is also a former national auditor of the PDP.